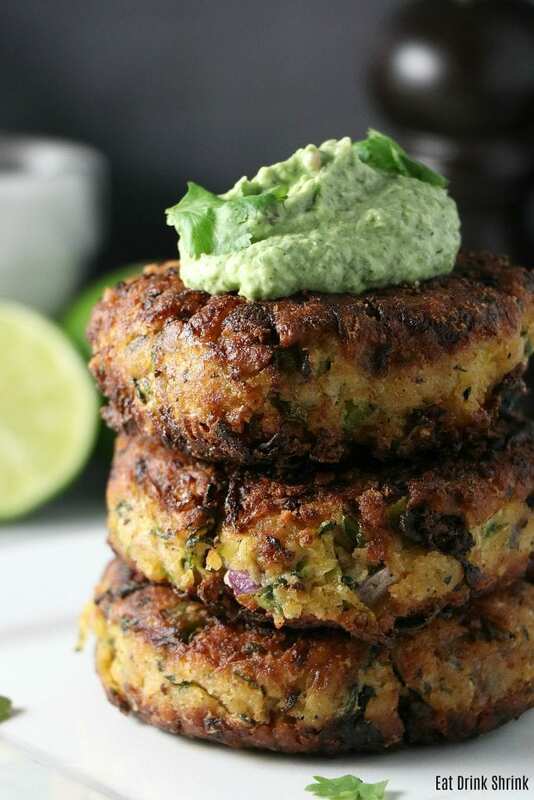 Vegan Jalapeno Zucchini Fritters - Eat. Drink. Shrink. After creating upwards of 300 recipes, there are a few that are just permanent staples in my cooking routine.. 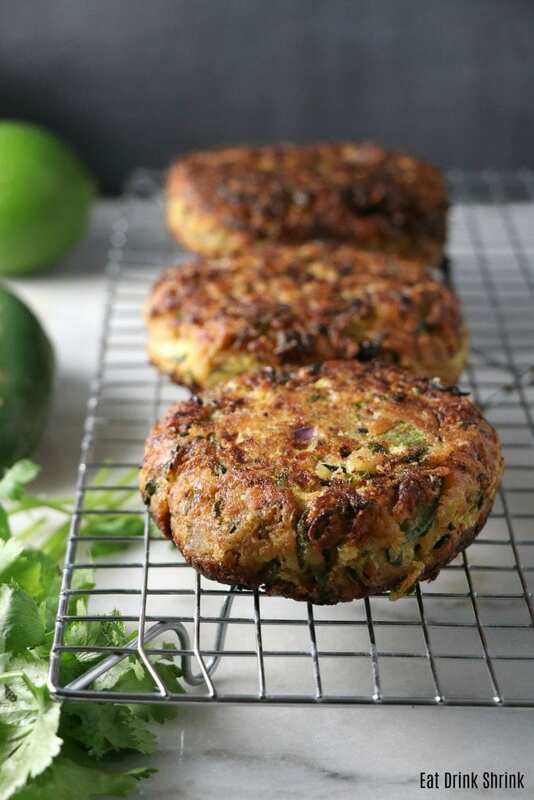 These vegan Jalapeño Zucchini Fritter are one of them! If you had asked me years ago what I fritter was, I probably couldn’t tell you lol. The only fritter I had was at a vegan donut shop, and that’s probably because fritters are always egg based as it serves as a binder. So what the heck is a fritter? It’s an egg based patty that simply has whatever you like thrown into it, so the options are endless! Being an enthusiast of heat.. so this recipe was a no brainer! The image above was the first version I made while finishing undergrad. Although the images are not to my liking the recipe was perfection! This new version I decided to tweak it a bit with removing the white flour and adding Panko and recipe actually tastes even better! What I love about this recipe is, everything! It’s packed with zucchini, easy, affordable, can even be made into a vegan sandwich, the vegan egg serves as the perfect binder, packs heat, so much flavor, and the avocado cream is the perfect match for this dish and countless others, perf for any season, and non vegan approved!! 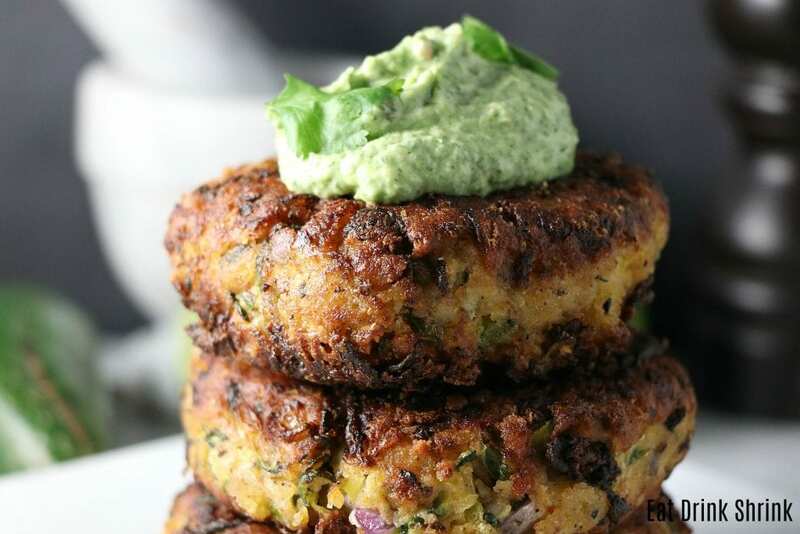 If you love effortless vegan concepts that pack veggies and heat..
You need to try this recipe for vegan Jalapeño Fritters with avocado cream! Grate zucchini, sprinkle with salt, let stand for 10. Make the vegan egg, stir, combine, should have a semi thick consistency. (let it stand for a few minutes, will thicken more) Take a cheese cloth or mesh nut milk bag and place zucchini in it and squeeze out the excess water. There should be at least 2 cups of water removed. Once zucchini is drained place in the bowl with the rest of the ingredients and mix to combine. (I combine the dry ingredients first) The consistency should be thick not soupy. 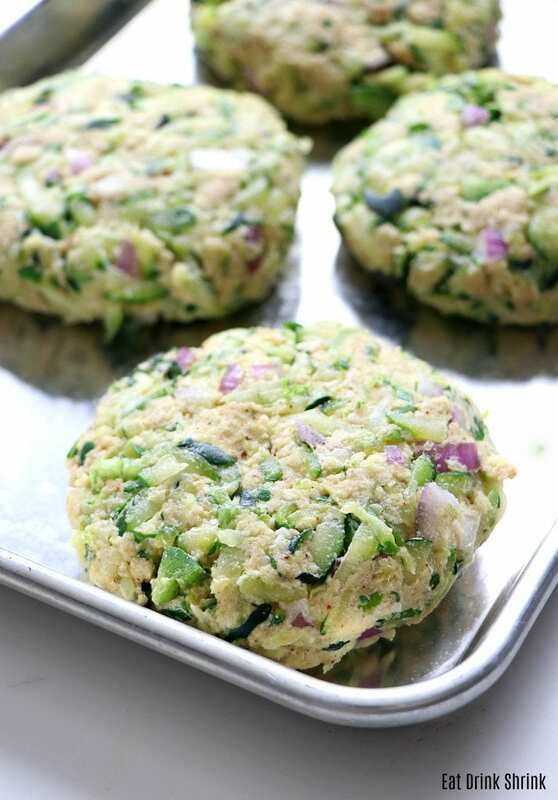 Heat vegetable oil in a medium size pan on (medium-high heat) and form the mixture into a patty. The pattie should sizzle, you want it hot. The hotter it is the crispier they are and less soggy they can be. Also, the thicker you make the patty the longer it will take to cook and the more likely it can get soggy. Make a small dish of additional vegan egg, wet each patty with it then throw on the pan. Let it cook on one side for 3-5 minutes, then flip. I would cook one at a time to make sure that they cook optimally! 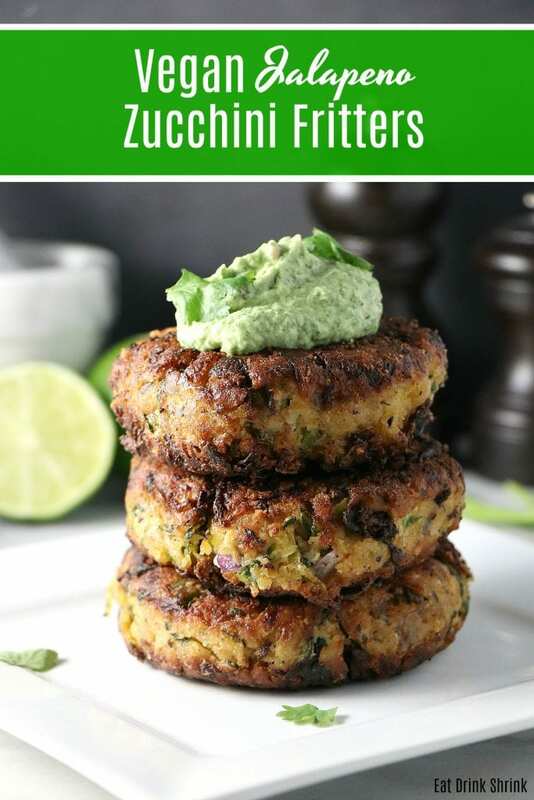 Transfer the zucchini fritters to the paper towel-lined plate and immediately sprinkle them with salt. Repeat the scooping and cooking process with the remaining zucchini mixture. If you're still seem soggy, throw them in the oven for 10 minutes on 350, will drain the liquid more and still give a crisp edge. 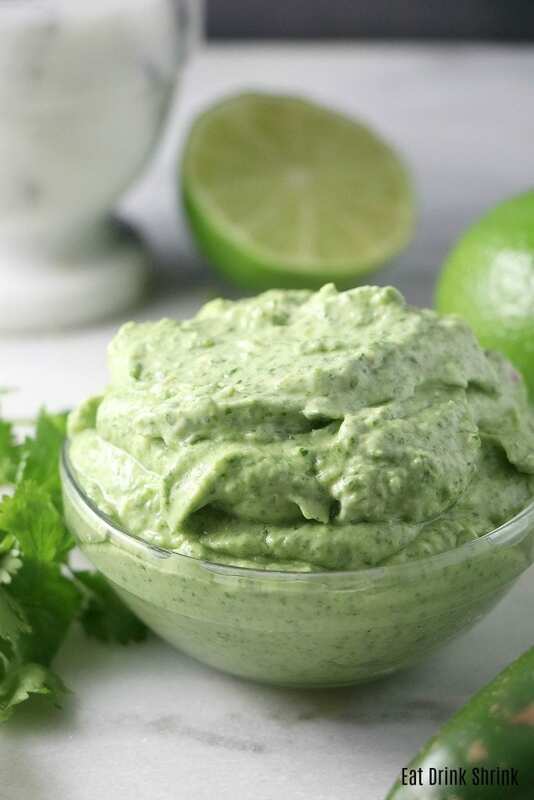 Avocado cream: Place everything in a food processor and pulse until smooth. Place in fridge until ready to serve. 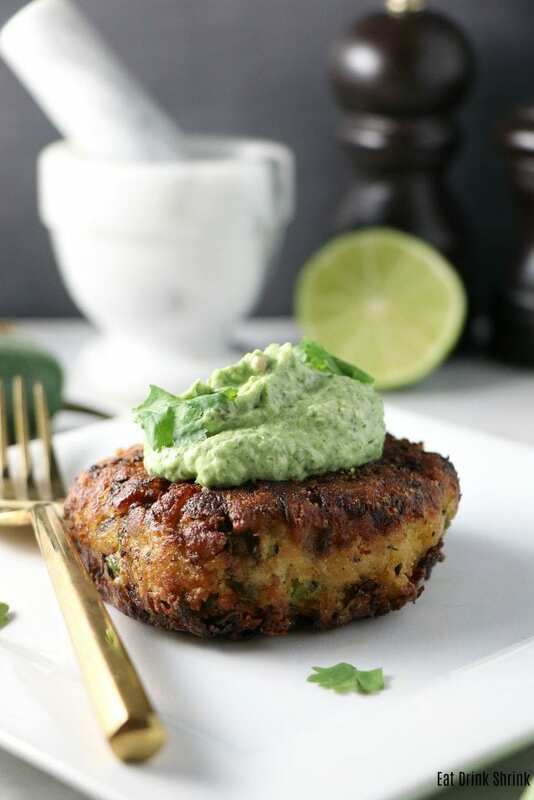 Top the patties with avocado cream, cilantro, and serve immediately! Awe, yay! Let me know how these turn out!